The Hubbub: ZLab3d Now On 3D Hubs! ZLab3d wants to be your high-resolution print provider! Visit ZLab3d’s Hub on the worldwide network of 3D printers, 3D Hubs. Jewellery is frequently the focus of B9Creator posts and discussions, but it’s also great for hobbies and crafts and even mini-heads! Just launched on Kickstarter, the MiniU is a worldwide effort linked by the internet and powered in part by the B9Creator, which is to be used for the individually-custom-painted heads. Something like this is just waiting for an Indian entrepreneur to launch domestically! 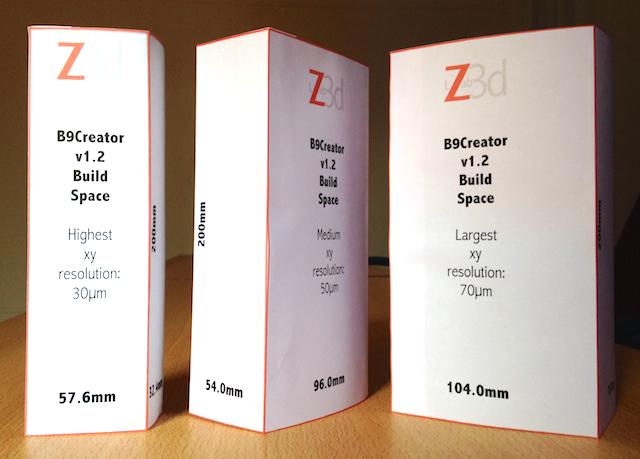 Thanks to the wonder of time-lapse, ZLab3d quickly shows how easy it is to assemble the B9Creator kit right here in India with simple tools and the pdf pictorial guides from B9Creations. Just announced at the B9Creator Forum by Mike Joyce, B9Creator software version 1.7.2 is now available in three OS flavors. If you’re new to B9Creator and have doubts about support from Mike, just look at the change log and you’ll see a lot of changes that are also reflected in Forum topics. Mike listens, Mike takes action to improve the product. Simply print the pages on sturdy A4 paper, cut along the lines, and fasten together with the dotted boxes. India’s first B9Creations 3d printing resin dealer is proud to announce we are now officially distributors of B9Creator printers as well, one of only 12 worldwide! B9Creator is offered in an assemble-it-yourself kit and assembled. See our 3-minute video to see how easy it is to do it yourself. Contact us now for your quotation! The B9Creator is in high demand worldwide and subject to delays, so the sooner you place your order the sooner you can receive your printer. B9Creator 1.2 in India; B9 sw 1.7.1 available! ZLab3d’s B9Creator v1.2 has arrived at the lab and is nearly assembled after only about 3 hours’ effort, thanks to the fine pictorial pdf’s from B9Creations. Just in time, Mike Joyce has released B9 software v1.7.1 for Windows, with Mac and Linux versions to come soon. For quite a while now, 1.7 was in a beta form and lots of activity and feedback was posted in Forum topics. Preview or go ahead and join the B9Creator Forum any time (Registration link at the top of the page), to check out your community should you become an owner, or to read and inform your purchase decision. B9 is not for everyone, but if it is a good match for you, the Forum is a good place to spend some time. Indian jewellers and hobbyists considering the B9Creator printer needn’t worry about buying the kit version, which you assemble on your own, saving considerable funds. B9 user Eddie J has posted some photos and descriptions of his work at the B9Creator Hardware Forum. Before you buy, take a look at the well-done assembly instructions pdf. This is an example of what you get with the B9Creator community. You’re not dealing with large foreign companies. Users worldwide join in a cooperative information effort and everyone saves money and time. B9Creator, India’s most affordable solution for fully castable 3D prints from your CAD files, is a new concept for many Indian jewellery makers. Now, you have full control over an imported machine. Instead of a box arriving at your factory, and later a foreign technician coming in to assemble it and leave as quickly as possible, you assemble B9Creator with an easy to understand, downloadable pdf and well organized packages of labeled parts. Learn to use its free software by exploring the online user Forums. If anything is unclear, post an inquiry on the Forums and you’ll likely have an answer from the worldwide B9Creator community (of which ZLab3d is a part) very soon. Implement improvements on your own, there are no restrictions on modifying the machine! You can design and locally build your own components, source parts locally, it’s your printer! The power of 3D printing, now fully under your control in your factory. Many thanks to the hundreds of stall visitors at IIJS in Mumbai, India, these last few days. In response, we’re launching an FAQ (Frequently Asked Questions) page, starting with a section on B9Creator with the most popular issues.